UEL Chair Mr Tiny Kox welcomes the release of Mrs Leyla Guven, after a hunger-strike of 79 days in a Turkish prison. Mrs Guven is MP for HDP and was in pre-trial detention since the beginning of 2018. In jail she started a hunger-strike to put pressure on the Turkish authorities to improve the conditions of political prisoners at Imrali-island, amongst who Mr Abdullah Ocalan. Yesterday, at the request of UEL, the Parliamentary Assembly of the Council of Europe, debated the worsening situation of oppositional politicians in Turkey. 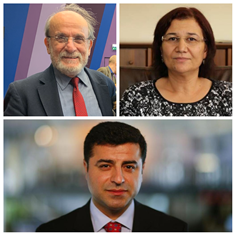 The Assembly adopted a very clear and strong resolution, calling the Turkish authorities to immediately release Leyla Guven as well as Selahattin Demirtas (who is in prison since two years, although the European Court of Human Rights has ordered his immediate release. The Assembly also urges the Turkish authorities not to execute a two years sentence against PACE honorary member Mr Ertugrul Kurkcu, as he is under the immunity guarantees from the Council of Europe. 1. The worsening situation of opposition politicians in Turkey: what can be done to protect their fundamental rights in a Council of Europe member State? Debate: The worsening situation of opposition politicians in Turkey: what can be done to protect their fundamental rights in a Council of Europe member State? PACE – Resolution 2260 (2019) – The worsening situation of opposition politicians in Turkey: what can be done to protect their fundamental rights in a Council of Europe member State?